As a New York City publicist who specializes in on-screen entertainment for kids, I’ve worked with some of the most popular and successful shows in the children’s TV playground for decades. 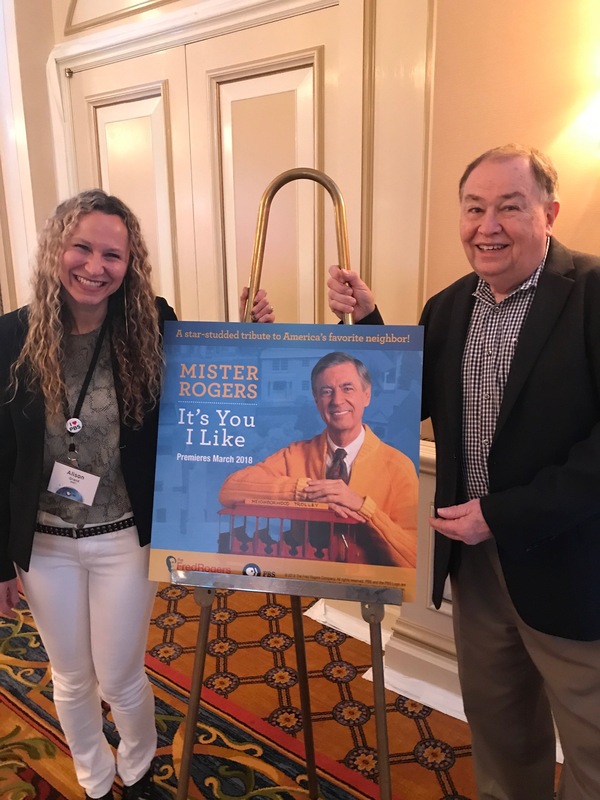 Though my experiences working with the different kids’ brands my team and I have represented are unique and each one is a gem in its own right, I found that promoting Fred Rogers and the 50th anniversary of his Mister Rogers’ Neighborhood this year to be a labor of love. It helped give me a spring in my step on my morning commute. It was a good feeling. A very good feeling. Mister Rogers’ Neighborhood, that widely and long beloved children’s series, was and always will be inextricably linked to Fred Rogers, the man on TV with whom I often visited as a child myself. Publicizing it has been like celebrating a dear old friend. I never got to work with Fred directly, but it dawned on me one day in looking over an email about the freshest batch of “love letters” we secured from media across the country for Fred Rogers Productions around the 50th anniversary milestone that I was now part of the fabric of the show’s history, woven into the tapestry with those both before and behind the camera, who lovingly helped shape and amplify the series, extending the wisdom and mission of the man at its center. This has been the “year of Fred” – from the PBS documentary and the one from Morgan Neville on the big screen to the Forever postage stamp, the Paley Center, the Google Doodle, the Jeopardy! category, and other such public celebrations and reflections. And all this Fred feting will continue strongly into 2019 with the feature film starring Tom Hanks as Fred, a new book of Mister Rogers’ poetry and more. In working to shine a spotlight on the series in its 50th year, I got to meet Mr. McFeely (David Newell), talk with TriStar Pictures execs about the best time to release the news about Hanks being cast for the upcoming movie, and have dinner with Newell and Nicholas Ma, Yo-Yo Ma’s son, both of whom appeared on the show – but the real treat (and trip!) was getting to promote the work of the incomparable Fred Rogers. And though one of Mister Rogers’ main messages was always “you are special,” it quickly became apparent from the PR campaign we drove that my own love for Mister Rogers and the diverse, socially-conscious, “woke”-before-its-time TV neighborhood he created, wasn’t special or unique, but rather universal, something broadly and deeply shared by so many from my own generation, one of the first to call this remarkable TV friend our own, as well as all the other generations with which he so meaningfully connected over his career-long commitment to serving children. That 2018 has been Fred’s year is especially apropos. The concept that everything we need to know we learned in kindergarten seems to need some extra reinforcing these days. Politics are a reflection of and on our society. Instead of political heroes, kids today are getting the message that disparaging or bullying others, rather than helping to support and raise them up, as Fred always modeled for us, is accepted or encouraged. And though politics is a grown-ups’ sandbox, it’s kids who have repeatedly come up in the crosshairs, ground zero in the scary ongoing narrative – whether its putting an end to the DACA protection program, siccing ICE on immigrant families where they live or work or, most recently, the forced separation of children from their parents at the border. From this distinctly non-neighborly stance, it’s a slippery slide to violent crimes against certain groups of people – like the tragic shooting of black shoppers at a Kentucky supermarket and of congregants at a synagogue in Pittsburgh, hometown to Fred and Mister Rogers Neighborhood, in the past month alone. Publicizing the 50th anniversary of Mister Rogers’ Neighborhood has brought back so many fond memories – speedy delivery! – for me, for the media covering the story and for audiences across the generations. Fred’s wisdom and messages of kindness or expressions of care, as he referred to them, not only still resonate with so many, they’re needed now more than ever. And by taking a page from Mister Rogers, we could all help set the stage for far more beautiful days ahead. This article is also on CommPro. © Copyright 2018 Grand Communications. All Rights Reserved.